As the title says, the json file for company 11069499 doesn't have a SIC code field. I was under the impression that all companies had to supply a SIC code. If not, if would be helpful if there was an empty field here. I don't know what the requirements are but Beta at least suggests this is allowed as it says "To be provided on next return". 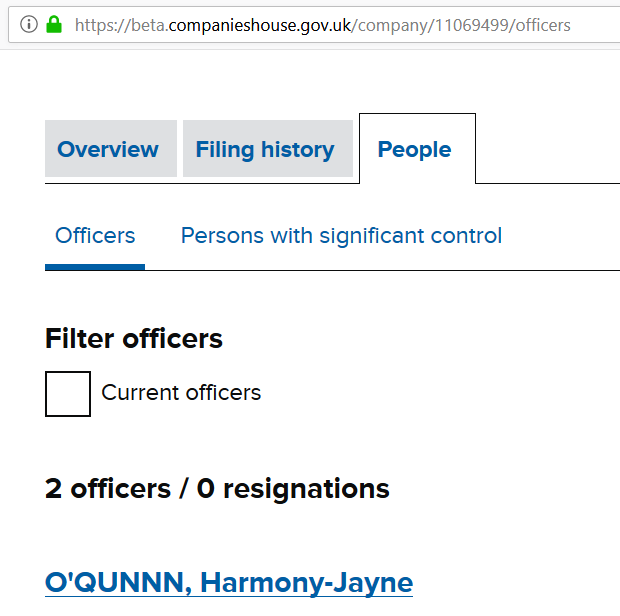 Company 11069499 shows one director's name as: O'QUNNN, Harmony-Jayne (see officers list in Beta) [image] This is incorrect per their IN01 filing where it's clearly O'QUINN, Harmony-Jayne [image] OCR issues? Thanks for the response. Google results suggested that the Small Business, Enterprise and Employment Act 2015 means that from 30th June 2016 companies now have to supply a statement of the type of company it is to be and its intended principal business activities.” during registration, which appears to mean SIC code. That's where I got that idea from anyway, hopefully someone from CH will clarify. In any case, it would be nice to have an empty field if there is no SIC code (unless there's a good reason why not). ...so definitely over to CH to fix that. I still don't know why Beta is happy to say "To be provided on next annual return" if it's a requirement.